First of all, I am a 90's baby. I was born in the era of Nirvana, No Doubt, Backstreet Boys, Savage Garden, TLC, and more. I still remember the simple piece of elastic choker, which has become a trendy accessory these days. Of course, I am extremely happy about this trend, because it obviously takes me back to my childhood. You probably remember me as a fashion blogger with the rock chic look from The Equinox Fashion Instagram. However, the urban grunge style is my signature right now. How to create the modern 90's fashion look? Welcome to my streetstyle fashion bible. I got this leopard slip dress from Quiz Clothing, and I absolutely adore it. Well, I am a sucker for zebra and leopard print, so...The obsession is real guys. However, this's not a silk or satin slip dress. Therefore, the fabric doesn't come with that oh-so-luxe touch. Of course, 90's baby is all about attitude and individuality, right? Who says we need the luxury feelin' when the street grunge look is what we aim for. It actually came in a whole set, I mean the dress came with the tiny black cropped top. If you wanna go 90's, a choker is a must baby. As some of you may know that I work with Villains SF, as a social media marketer and stylist. I can preview the collection of Jeffrey Campbell before anyone else, because we are the representative of JC shoes in Thailand. In fact, I have been wearing Jeffrey Campbell for ages, because I feel like I can see myself in their shoes more than any other brands. It's weird, it's crazy, and I LOVE IT! Yes, an oversized blazer is a must in our wardrobe. I wore this blazer to Rebecca Minkoff Thailand launched event 2 months ago, if you remember. The reason why I paired this blazer with the rest was that I had to attend the meeting. So, this modern 90's style was not only speaking of my character, but I also went to the meeting in style. Who says I need the formal attire for the official meeting anyway? แก้วได้เดรสลายเสือนี้มาจากแบรนด์ Quiz Clothing แล้วก็ชอบมากกเพราะว่าแก้วเป็นคนที่ชอบอะไรที่เป็นลายม้าลายและเสืออยู่แล้วแต่ว่าเนื้อผ้าจะไม่ได้เป็นผ้าซาตินหรือไหมนะคะดังนั้นเวลาจับเดรสตัวนี้จะไม่ได้แบบลื่นแบบหรูๆ แต่เอาจริงจะเป็น 90's เกิร์ลก็ต้องมาในแบบดิบๆปะ? จริงๆเดรสตัวนี้มาพร้อมกับครอปทอปตัวจิ๋วสีดำที่ใส่แมทช์กันแบบพอดีๆ อ้อแล้วก็อย่าลืมโช๊คเกอร์นะ! บางคนอาจจะรู้อยู่แล้วเนอะว่าแก้วทำงานให้กับ Villains SF ในฐานะคนเล่นโซเชียลมีเดียและสไตลิส ดังนั้นแก้วจะมีโอกาสเห็นคอลเลกชันใหม่ๆของรองเท้า Jeffrey Campbell ก่อนใคร แต่จริงๆแก้วใส่รองเท้าแบรนด์นี้มานานมากแล้วเพราะว่ามันเป็นสไตล์ที่ใช่สำหรับแก้วมาก รองเท้าแบบทั้งแปลก ทั้งบ้า ชอบมากค่ะ! Stunning and comfortable look indeed. Warm greetings! Really love your outfit babe! Yes! I was always obsessed with Gwen Stefani and No Doubt. I remember listening to a lot of Nirvana growing up as well. Still feel that era's influence, though, I was born in the early 80's so I do tend to also love some of the 80's things like oversized blazers. Ahh babe! Loving your take on 90s fashion! That was the period of my 'fashion awakening' and all this 90s fashion throwbacks is giving me serious nostalgia! Beautiful look! Love the dress! Great tips girl, I love that you changed things up and made this look more fun with leaopard print rather than a plain dress. And yess an oversized blazer does do wonders. This is one of my fave looks on you Gail; love how you've always true to your personal style and totally picking up on the 90s vibes here. This leopard print slip dress is perfection! Thanks for the tips! The outfit is lovely, love the blazer! Love animal prints..And you have styles it right. 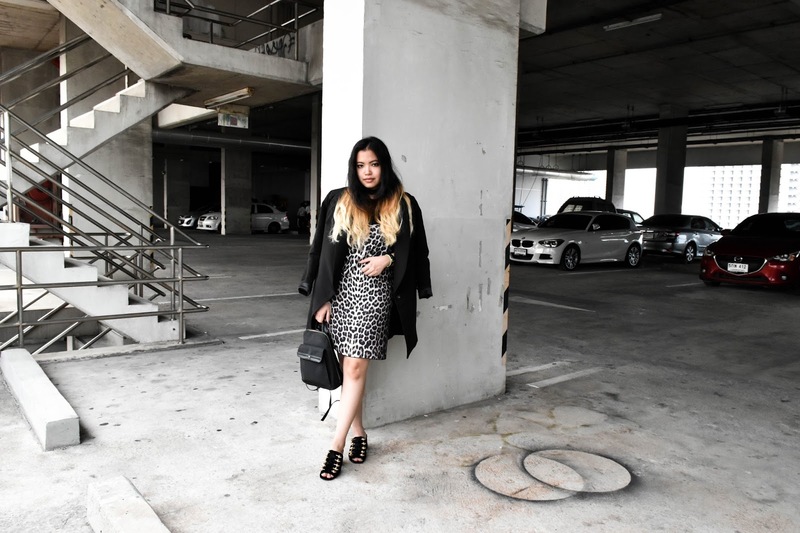 I'm not much of a leopard-print fan anymore but you took this look to a whole new level! Nice look! I love this dress and the photos! Bem lindo o seu look. Gosto de estampas animal print. Just lovin' your leopard dress!!! SPECTACULAR!!! And such a cool vibe! WOWOWOW!!!! Fab look! And totally agree, Jeffrey Campbell kills it EVERY TIME! This is a truly fantastic way to bring the style to 2017! I'm serious, it's so cool, and those shoes really complete the look! You and this outfit are gorgeous! You look like you should be in a movie omg. LOVE your outfit and those sunnies!